Climate risk and green roofs featured in a number of interesting pieces last week. From Dhaka in Bangladesh to Berlin via the UK, green infrastructure will be key to resilience. The Bangladeshi capital Dhaka joins a swathe of cities around the world that are incentivising green roofs. The city corporation is trying to encourage the use of green roofs to help cool the city during hot periods. Being in the tropics, intensive green roofs will be the order of the day. “If a person grows only vegetables in a 600-700 square feet roof, it is enough to meet the yearly demand of a family having 6-7 members”, believes Ehteshamul Haque Mallik, President, Urban Roof Gardeners Society. Mallik has a 1500 square feet garden on his roof, where he has been growing a number of vegetables and local fruits for the past 15 years. After his amazing success, he founded the organisation two and a half years ago and through this, he is helping more than 500 members. Heat waves and rainstorms will become the norm in northern Germany as climate change deepens. Experts envision heat and flood proofing the city of Berlin by making it into an “urban sponge,” Using green roofs, green walls and wetlands will be a key part of how the city adapts to climate change. Berlin already has one of the highest densities of green roofs in the world. These interventions will be ‘sponges’. The vegetation and soil will absorb water keeping it in the city. As the city heats up, the water will evaporate, cooling the city. Last week there was a call for more to be done to help UK cities meet the challenge of climate risk. The report – UK Climate Change Risk Assessment 2017 – clearly states that cities are not doing enough to promote the use of green roofs and walls. 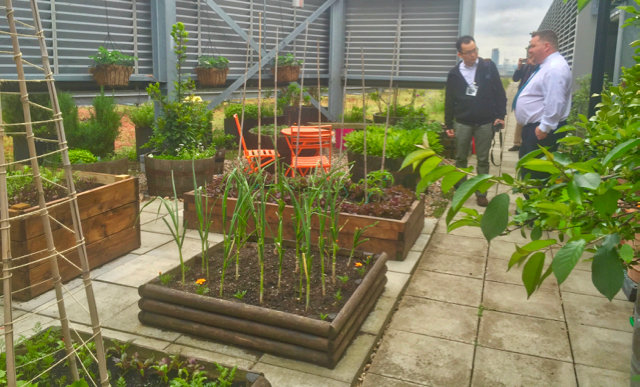 Last week we highlighted this and showed how, although London leads the way, in most other cities green roofs and walls are the exception not the rule. All three stories implicitly call for the retrofitting of green infrastructure on older buildings. Although both Berlin and London have large areas of green roofs on new building stock much of the older stock is not greened. It is feasible to retrofit green roofs on older buildings. We have estimated that there is potentially 10million m2 of roof space in London that could be retrofitted. This would make a significant positive impact on climate risk in the capital city. How this will be incentivised is still an open question though?